“The largest armada of land, air and maritime forces ever assembled to provide security at a national political gathering are being deployed in New York for the Republican convention,” reports the New York Times (25 August). A “security zone” has been established in midtown Manhattan, where anyone entering will be required to show identification and may be subject to random searches by security forces. The New York Police Department (NYPD), with 37,000 cops and a budget that would make it the 20th largest standing army in the world, is being supplemented by thousands of federal agents. National Guardsmen patrol the subways. The president’s praetorian guard, the U.S. Secret Service, is in charge of overall security. Meanwhile, demonstrations against the Republican National Convention, which are expected to exceed a quarter million protesters, are denied permits to rally in Central Park. Instead, they are to be pushed onto the West Side Highway, to be confined in what amounts to a giant police pen. The authorities’ plan will inevitably provoke chaos. Mayor Michael Bloomberg warns demonstrators that if they are not “reasonable” and “abuse our privileges,” then they “will lose them.” Thus the rights of free speech and assembly are turned into “privileges” that can be revoked by the government. But the crackdown is not limited to New York City. Nationally, the FBI is going around “knocking on doors” – and using its authority to carry out “sneak and peek” break-ins – looking for “troublemakers.” The USA PATRIOT Act* is being used to the hilt. Since the 11 September 2001 (“9/11”) attacks on the World Trade Center and Pentagon, there has been a wholesale assault on democratic rights in the United States and around the world. Draconian internal security laws have been imposed in countries ranging from the U.S. and Britain to Mexico and India. The population is being regimented for the open-ended “war on terror” proclaimed by President George W. Bush. Liberals wring their hands out of concern over the threat to civil liberties in this repressive climate. They worry about “overreaction” to 9/11 and about the political motives of the Bush regime. But the vast expansion of police-state measures in the U.S. is not an act of retaliation, or partisan “dirty tricks” – it is the result of bipartisan plans by the ruling class that considerably predate the terror attacks of 2001. A century of imperialist war has led to an increasing institutional bonapartism, in which the executive power is increasingly independent of any restraints. Since the counterrevolutionary wave of 1989-92 that destroyed the bureaucratically degenerated/deformed workers states of the Soviet Union and East Europe, this trend toward regimentation and militarization has sharply accelerated throughout the capitalist world. No longer constrained by the fear of a “communist threat,” independent of whether Democrats or Republicans are in office in the U.S., or social democrats or bourgeois right-wingers in Europe, the social programs of the so-called “welfare state” have been relentlessly shredded – and along with them the pretense of “democracy.” Economic counterrevolution and political repression are intimately linked. Now this is all coming to a head. The government’s attempts to whip up a terror scare are only the pretext, which is not to exclude the possibility of another attack, or “foiled” plot – this would very much serve the interests of the present ruling clique. Instead, like the lockdown of Wall Street and Lower Manhattan following 9/11, the present “securing” of the central area of the financial capital of the world is a practice run for martial law – or more accurately, for “martial rule,” since as the architects of these plans state, no new laws are required to impose military control. The state of national emergency decreed by President Bush on 14 September 2001 remains in effect, and all of the government’s huge arsenal of previously existing repressive measures is available. As the national terror index goes from Code Yellow to Orange, and possibly to Code Red, the NYPD is going beyond its previous “Operation Atlas” measures. Atlas was implemented after 9/11 and again at the time of the U.S. invasion of Iraq. It included COBRA (chemical, biological or radiological actions) team deployments; HERCULES team sharpshooters posted on high buildings and at key locations; ARCHANGEL teams of Emergency Services personnel and bomb experts at staging spots around the city; HAMMER teams of police and fire department experts in hazardous materials on call; CAT cars of heavily armed counter-assault teams roaming in unmarked armored vehicles; and SAMPSON team deployments. “Surges” have been practiced in which scores of police cars swarm onto a block. If New York City is beginning to look like some Latin American capital after a coup, South Africa under apartheid rule or occupied Europe under the Nazis, this is no accident. Ausweis zeigen! (Show your pass) is translated into English and delivered at checkpoints by officials of myriad known and unknown security agencies with the arrogance that the German Gestapo (Geheime Staatspolizei, or Secret Police) was famous for. No, America isn’t going fascist right now. 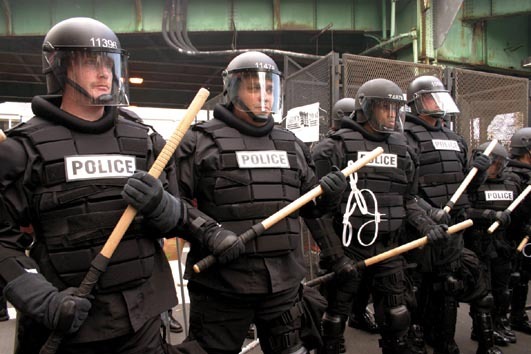 But the U.S. is moving sharply toward police-state repression. It isn’t a conspiracy, or preparation for a terror attack, but a concerted drive by the capitalist rulers to batten down their rule in anticipation of a storm of mass unrest as profits soar, wages fall, unemployment spreads and the casualties of “war without end” continue to mount. The Internationalist Group, section of the League for the Fourth International, says that to defeat this ruling-class onslaught, it is necessary to mobilize the working class at the head of the poor, oppressed minorities, immigrants and all those who would defend fundamental democratic rights, and to lead them in a revolutionary struggle for power. The intensified repression is a reaction of capitalism in its death agony, when the alternative is “socialism or barbarism.” And the key to stopping the forced march toward barbarism is to forge a revolutionary workers party. The USA PATRIOT Act is a huge piece of legislation, with a whole compendium of “anti-terrorist” measures. Yet it was rammed through Congress, without committee hearings and only one dissenting vote in the Senate, barely a month after the 9/11 attacks. How could it have been prepared so quickly? Answer: it wasn’t. It was put together from a whole series of repressive devices which the police and other security agencies have been trying to get for years, but were often rejected by elected legislatures. The same is true of state “anti-terrorism” laws, such as those enacted by NY governor George Pataki less than a week after the attack on the World Trade Center. All these laws build on the Antiterrorism and Effective Death Penalty Act of 1996 enacted by the Democratic Clinton administration. The USA PATRIOT Act ominously defines “terrorism” as any action that is “dangerous to human life” and violates any state or U.S. criminal law if the act is intended to “intimidate or coerce a civilian population” or “influence the policy of a government.” This elastic definition could include anything from civil disobedience over Navy bombing of Vieques to protesting the World Trade Organization to defending strike picket lines. It authorizes warrantless searches, indefinite detention without trial of immigrants, seizure of library and bookstore records, “trap and trace” devices for computers and e-mail, and prosecution of lawyers for aiding their clients, as well as many other things. At the same time, the administration declared anyone it picked up in Afghanistan to be an “enemy combatant” without rights as a prisoner of war, and set up a system of military tribunals which can be used against citizens as well. If acronyms could defeat “terrorism,” the government would already have won its phony “war on terror.” But the real purpose of these measures is to terrorize the population. And the acronymic jungle is a tip-off as how they plan to do it: through a massive bureaucracy of repression. It won’t be so much through arrests on the street and pre-dawn raids, although thousands of immigrants have been picked up in just that way, but by the sheer massiveness of the government’s surveillance and information resources. Already, undocumented immigrants cannot travel between cities by plane, train or bus without risk of arrest. Soon this will be extended to everyone. Meanwhile, Attorney General John Ashcroft has been working on a USA PATRIOT Act II (formally the Domestic Security Enhancement Act), with provisions to beef up spying on political dissidents and protest groups, obtain credit card information on purchases, eliminate the presumption of innocence on “terrorism” charges (thus preventing release on bail) and other goodies that would make any Gestapo or SS man smack his lips in anticipation. While Ashcroft’s secret PATRIOT II plan ran into flak when it was leaked to the Center for Public Integrity and published, it was soon replaced by the VICTORY (Vital Interdiction of Criminal Terrorist Organizations) Bill. The government’s “anti-terrorist” arsenal of terror is so threatening that even groups not known as fire-breathing radicals have gone to war against this expansion of police-state powers. The American Library Association has risen up in arms and against PATRIOT Act snooping. The stereotype of meek little “Marian the Librarian” hardly fits as librarians stayed at work late shredding borrowing records so the feds couldn’t get their hands on them. Three states (Hawaii, Alaska and Vermont) and 112 cities, towns and counties have passed resolutions condemning the USA PATRIOT Act as unconstitutional, most of them barring use of government resources under the law. These resolutions are expressions of opinion which won’t slow down in the slightest a government hell-bent on beefing up its police powers. More significant are the numerous motions by unions and city, county and state labor federations against the USA PATRIOT Act, in spite of the liberal politics they express. An example is the resolution passed by the Los Angeles County Federation of Labor on 27 January 2003. The resolution directly links the Patriot Act and Homeland Security Act with anti-labor actions by the government (“the Bush Administration has spearheaded a renewed assault on organized labor which includes use of Taft-Hartley against dockworkers”) and the war on Iraq (“the war is a pretext for attacks on labor, civil, immigrant and human rights” as well as “a cover and distraction for the sinking economy, ongoing corporate corruption and layoffs”), saying these laws would “undermine labor’s right to organize and fight anti-immigrant attacks.” Yet the whole basis of the resolution is “social-patriotic,” concerned only about the effects on U.S. workers of a war that has slaughtered thousands of Iraqis. And it is toothless. Yet labor does have the power to fight back against such police-state laws. In Germany even as Cold War McCarthyism held sway, unions played a key role in unleashing protests against the emergency laws (Notstandsgesetze) pushed by the Grand Coalition of the Christian Democrats and Social Democrats that took office in 1967. This then fed the growth of New Left student “extra-parliamentary opposition.” But to seriously combat the attacks on democratic rights requires above all a political program that goes beyond the myths of bourgeois democracy to challenge the fundamentals of capitalist rule. The “terrorism” hysteria in the U.S. today will not be defeated by appeals to the Constitution, although Marxists certainly defend the Bill of Rights against attempts to do away with the rights supposedly enshrined in these amendments. Democrats and liberals share the premises of the USA PATRIOT Act and other “anti-terrorist” legislation, and indeed the Clinton administration initiated many of the police measures contained in it under the guise of fighting “espionage.” And while they may think the Bush administration “goes too far,” the fact is that the whole raft of repressive laws is the product of an imperialist bourgeoisie anxious to shore up its rule “at home” so that it can continue to dominate the world. As Internationalist Group signs at antiwar demonstrations declare, “Imperialist War Abroad Means Police-State Repression ‘At Home’.” The fight against the war and cop terror must be part of a fight against the capitalist-imperialist system that spawns them, or it will be doomed to defeat. For even as it proclaims the supposed “death of communism,” the ruling class is preparing for internal war. “The future of warfare lies in the streets, sewers, high-rise buildings, industrial parks, and the sprawl of houses, shacks, and shelters that form the broken cities of our world. “Once the gatherers of wealth, then the processors of wealth, cities and their satellite communities have become the ultimate creators of wealth. They concentrate people and power, communications and control, knowledge and capability, rendering all else peripheral. They are also the post-modern equivalent of jungles and mountains – citadels of the disposed and irreconcilable. A military unprepared for urban operations across a broad spectrum is unprepared for tomorrow…. Peters, a leading U.S. military “theorist,” wasn’t just talking about Mogadishu, Beirut, Panama City or Baghdad today. He’s also explicitly talking about American military operations in Mexico City and Los Angeles. He worries that, “Confronted with an armed and hostile population in such an environment, the US Army as presently structured would find it difficult to muster the dismount strength necessary to control a single center as simultaneously dense and sprawling as Mexico City.” His article, infused with hatred of the impoverished urban masses, was a key influence in the U.S. military’s new attention to Military Operations on Urban Terrain (MOUT). This has pushed aside earlier doctrines on Military Operations Other Than War (MOOTW): the army isn’t just planning for “peacekeeping” during “civil disturbances” in places like Los Angeles, they’re planning for war. There has been concern among liberals and even some conservatives over the increasing weight of paramilitary units in U.S. police forces. The right-wing libertarian CATO Institute published a Briefing Paper in 1999 by Diane Cecilia Weber titled “Warrior Cops: The Ominous Growth of Paramilitarism in American Police Departments.” In the 1980s and ’90s, she notes, there was a huge growth in the number of such units. No longer the SWAT teams of riot cops as in the ’60s and ’70s, they are military squads equipped with automatic rifles, armored personnel carriers and even tanks. They train with Army Rangers and Navy SEALs. More than 90 percent of all cities over 50,000 have such police units. Now they are integrated into “homeland defense” under the Pentagon and “anti-terror” czar Tom Ridge. But their target is not Osama bin Laden. Moreover, the regular military has increasingly become active in domestic policing operations. For many years this was considered off-limits because of the 1876 Posse Comitatus Act, which at the time it was passed was a reactionary law ending the occupation of the South by the Union army following the Civil War and spelling the death knell for Black Reconstruction. As Union troops pulled out the Ku Klux Klan was soon riding and Jim Crow segregation was instituted to keep millions of freed black former slaves “in their place.” For decades thereafter, this law was held to prevent domestic military operations by the army, although that didn’t stop Clinton from using the Army to incinerate a religious group at Waco, Texas in 1993. But the ghetto upheavals of the late 1960s changed that. While the bourgeoisie just dismissed them as riots (while New Leftists idealized them as “uprisings”), the sight of the police and army fleeing Washington, D.C. as large parts of the U.S. capital burned following the 1968 assassination of Martin Luther King, Jr. sent shivers down the collective spine of the ruling class. They pushed poverty programs to buy off some black politicians and spread a few crumbs to defuse the discontent. But they also revamped the military and police apparatus to prepare for intervention in U.S. cities against the angry minority population. The resulting master plan was known as “Garden Plot” and it has been regularly updated since the 1960s. Army Field Manual 19-15 on “Civil Disturbances” states that “the president can employ armed federal troops to suppress insurrection, domestic violence, unlawful assemblies” – a pretty broad category – and in this case “authorities must be prepared to detain large numbers of people.” If necessary, temporary detention facilities are to be set up on military bases. FM 19-15 also touches on martial law: “If the need for martial rule arises,” it notes, “it may be advisable to prevent people from assembling…. Prohibitions on assembly may forbid gatherings at any place and time…making hostile or inflammatory speeches,” etc. (Frank Morales, “‘Homeland Defense’ and the Militarization of America,” Project Censored, September 2003). In 1984, Ronald Reagan issued Presidential Directive 54, authorizing the Federal Emergency Management Administration to carry out a simulation of a “state of domestic national emergency.” According to a report in the Miami Herald, the REX-84 group (supervised by Oliver North’s crew at the National Security Council) planned for the detention of up to 400,000 undocumented immigrants at military bases. “One aim of the Rex 84 exercise was to determine what types of national emergency would be severe enough to persuade the majority of Americans to accept even a temporary suspension of normal Constitutional government” (Harry Helms, Inside the Shadow Government: National Emergencies and the Cult of Secrecy ). But the big spur to plans for domestic military operations was the Los Angeles upheaval of April 1992 that followed the acquittal by an all-white suburban jury of the cops who brutally beat black L.A. motorist Rodney King. As South Central and other black and Latino areas of the city exploded in anger, the police pulled out. The rage was sometimes misdirected at individual white drivers who were caught in the area, and also led to widespread looting and the torching of over 1,000 small shops, particularly “mom and pop” convenience stores and liquor stores owned by Korean immigrants. Proletarian revolutionaries denounced the racist verdict while saying that protest should be directed at the state and the capitalist order it defends and protects rather than against small merchants and hapless drivers. The Los Angeles city and California state governments called on the federal government to send in the Army and National Guard. While George Bush I was president at the time, the recommendation came from Democrat Warren Christopher who was part of an advisory commission to the LAPD. The military forces moved in, arresting more than 13,000 people, killing some dozens and injuring hundreds. Hundreds of immigrants who were seized were then deported. L.A. continued under military occupation for weeks, although the courageous (and largely immigrant) janitors of SEIU Local 399 braved the repression to carry out a protest march in the middle of the unrest. In the aftermath, the military has exhaustively studied the L.A. example. One study, by the Foreign Military Studies Office of the U.S. Army, concluded: “Many misunderstood the LA Riot of 1992 as a predominantly race riot. As witnessed by the California National Guard Field Commander, the riots were seen as a case study in urban warfare.” In fact, the upheaval was not “racial,” but an outpouring of anger by both impoverished blacks and Latinos. But the fact that the military classified it as a “case study” of “urban warfare” is significant. The same study compared the U.S. military action to that of the Brazilian army occupation of slums of Rio de Janeiro in 1995, and found the latter more effective: “During Operation Rio, the efforts of the Armed Forces restored confidence and trust in public authorities” (William Mendel, “Combat in Cities: The LA Riots and Operation Rio,” FMSO Study, July 1996). Previously the excuse for militarizing the policing of U.S. ghettos and barrios was the phony “war on drugs,” which was really a war on oppressed minorities. Now they are ratcheting up their operations under the guise of “homeland security” and an equally phony “war on terror,” which is actually an attempt to terrorize and regiment the population. The Bush administration is pushing this for all it is worth, but the designing of much of the new apparatus for domestic repression comes from Democrats. Not only did Connecticut senator Lieberman first put forward a bill for the Homeland Security Agency (HSA), over objections from the Bush White House, but plans for this agency were drawn up by the U.S. Commission on National Security/21st Century presided over by the former senators liberal Democrat Gary Hart and moderate Republican Warren Rudman. The Hart-Rudman report, Road Map for National Security: Imperative for Change (February 2001), laid out in detail the structure of the HSA, prefiguring a national police/military/intelligence agency that parallels the Nazi Gestapo. Their argument was that a “direct attack on American citizens on American soil is likely” – written months before the 9/11 attacks. More recently, The 9/11 Commission Report (July 2004) of the National Commission on Terrorist Attacks Upon the United States has called for setting up a national intelligence director to run a greatly expanded domestic spy agency. (Corresponding to this is the establishment for the first time of a Continental Command of the Pentagon for operations in the United States.) Democrat John Kerry has challenged Bush to implement the Commission’s report to the letter, thus positioning himself as the leading “hawk” for internal police repression. This is what his talk of being a “better commander” for the war on terror means. The Hart-Rudman report, while using the pretext of an impending terrorist attack (which was then realized only a few months later, while by its own account the Bush government was well aware that something was in the offing), underscores the economic factors that are behind their calls for tightened domestic “security.” Future scientific-technological developments and “globalization” mean some people will be “marginal,” they write: “This means more polarization between those with wealth and power and those without – both among and within societies.” The increasing economic polarization in the U.S. is well documented, reflecting intensified exploitation as CEOs earn over a billion dollars a year while wages are falling generally and low-wage jobs with no benefits are replacing union jobs at a rapid pace. We have written before that as the economic and social structure of the U.S. increasingly tends toward the Latin American model of a huge impoverished mass at the bottom with a tiny super-rich elite and a hollowed-out “middle class,” the domestic “security” forces in this country will increasingly resemble those of Latin America, whose primary mission is internal war against the working people and poor. Liberals will decry the loss of civil liberties and look to the reactionary courts – in vain, because the judicial system is part of the machinery of the capitalist state and its vaunted “independence” a myth. The conservative-dominated Supreme Court, which legalized Bush’s power grab in the 2000 elections on the basis of no law or legal precedent, will facilitate whatever police-state measures the bourgeoisie deems it needs to protect its class rule. The dramatic increase in repressive powers does not mean that the United States is presently on the verge of a coup, nor a full-fledged police state is imminent. But the U.S. is moving in the direction of an increasingly bonapartist “strong state.” The military is aware of this. Significantly, the winner of the 1992 “Strategic Essay Competition” sponsored by the Joint Chiefs of Staff was an essay by Colonel Charles Dunlap, then studying at the National War College, titled “The Origins of the American Military Coup of 2012.” Dunlap’s paper decries the fictional coup, but his account presents this as a logical result of developments already under way. “The bourgeoisie is trying to concentrate the executive power in the hands of a few men who impose their decisions by means of an administrative, military and police apparatus, which is brutal, uncontrolled, costly. “The bourgeois plan of the ‘authoritative state,’ directed against the exploited, must be ruthlessly attacked by the toiling masses. “Only the laboring masses, taking their future into their own hands, in one powerful revolutionary thrust, can energetically and with iron will create the necessary great power to save society from the capitalist oligarchy that corrupts it and leads it to ruin….